We selected this appartment for the living room space and were not disappointed. We were 9 people and enjoyed being able to eat breakfast together and hang out in the evening. It is an older appartment but very functional and we had no issues. The location is perfect, close to city center, metro and a grocery store across the street. Despite of our flight delay, the owner was waiting to receive us which was very nice. We would book this place another time. We stayed in this beautiful apartment for five days over the holidays. It is centrally located, spacious, and the bedrooms offer a quiet haven at the end of the day. We truly enjoyed our experience in this unit, which was made even better by the owner's kind and accommodating assistance with our check-in and travel arrangements. Hola Yania, agradezco mucho su sincero comentario sobre mi casa en Madrid, la verdad es que siempre procuro que los clientes se sienten, como Vd. dijo, en su casa y por unos dias, y que despues de un "duro" dia de turista en esta ciudad encuentren esta casa como su lugar relajado y confortable. 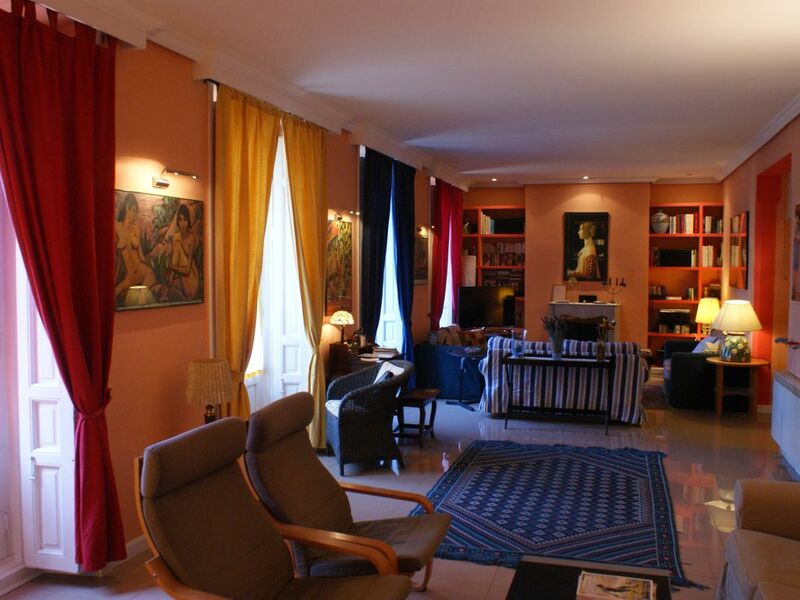 Beautifully appointed, spacious apartment near Plaza de Espana in central Madrid. Well maintained and kept spotlessly clean by the gracious host, Juan Antonio, who greeted his weary overnight travelers from America with a smile and a full refrigerator. 3 full bedrooms sleeping 6 comfortably plus a smaller cubbyhole type bedroom separated by a curtain from the main living area, sleeping 2 more. 3 bathrooms, modern appliances, comfortable beds, and plenty of room. Tastefully decorated with recognizable reproductions of European artwork, the originals of which could be found in the many fine art museums of the city. The apartment is on Calle Duque de Osuna within walking distance of Palacio Real, Gran Via and other sites in the west central part of Madrid. Convenient to many restaurants and a large Metro station, as well as the red "on-off" open air tour bus. We would heartily recommend this comfortable, homey oasis in the heart of a busy city, and found it to be much more pleasant and peaceful than a similarly priced place in central Barcelona. "Outstanding location. Truly spacious and very near to several metro stations and bus stops. At least fifteen restaurants within a 3 minute walk. Lovely decor. The owner is an outstanding host. He is a true gentleman offering suggestions and making sure you have a good stay. All eight of us had a wonderful time. Would certainly go back. Do not look any further, this is the place. Gracias Juan Antonio!" "I believe that it is the best apartment for someone to rent for a short-time period at Madrid. I was very happy to find myself there and I wish all apartments were like this one. Even though we were too many for an apartment, we found no difficulty because there was plenty of room for all of us. It's at the center of Madrid, and it's very close to the Metro and Bus stations. The apartment is very big, clean and you can find anything you need. Two big, clean bathrooms, large, comfortable bedrooms, a huge living room with many sofas, and comfortable armchairs, with tv, dvd, stereo,and pictures from the Madrid museums, fireplaces, a found kitchen with microwave,oven etc. You can see from your balcony one of the most famous streets, Princessa street and even Gran via. We were given maps and any info we ned from Senior Juan and his wife." To 50 m. Plaza de España, taking Princess St.in his right side. To 35 minutes of the airport in taxi or metro. Station Plaza de España 100 meters. Tarifas hasta un maximo de 8 personas, +2 personas adicionales preguntar propietario. Deposito/fianza previo de 200€ pagado 45 dias antes de su estancia. Tarifa principal a la llegada.